PLUGR’s PL855 Pro HD self-propelled hydrostatic drive aerator offers operators more productivity per hour, superior aeration results, and low maintenance costs, according to the company. The cam action engine power drives aerator tines into even hard soils, but is especially effective on soft or spongy areas. 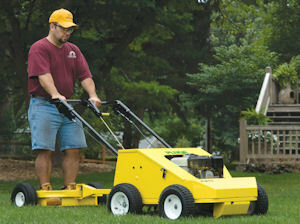 SourceOne Outdoor Power Equipment redesigned the PL855 with a sleek unibody construction, improved handle ergonomics and maintenance access, plus a built-in quick release receiver hitch for an optional PL050 StepSavr sulky. The addition of a StepSavr converts walk-behind equipment into ride-behind convenience, reducing crew fatigue and boosting productivity.